Whether it’s extra fees, smaller seats, or a lack of connections, low fares often come with strings attached. Here’s how to avoid the most common pitfalls. A low-fare airline is one that undercuts the prevailing fares in a given marketplace. In that sense, Southwest is a low-fare airline because, historically, it grew by entering and lowering fares on routes where the giant airlines formerly charged outrageous fares. The “Southwest effect” of lowering fares has become an integral tenet in airline economics. Even though the giant airlines were forced to match Southwest’s fares, it retains its low-fare leader position, but mainly when it enters a new market, not in established markers where its fares are often not the lowest. In today’s market, the really low-fare airlines in the U.S. are Allegiant, Frontier, Spirit, and Sun Country. In Canada, they’re Air Transat and Air Canada’s low-fare Rouge operation. In Europe, EasyJet and Ryanair are the giants, along with Norwegian and a handful of smaller “me, too” entrants. Similar regional lines have cropped up in much of Asia, the South Pacific, and South America. Some people in the industry group JetBlue and Virgin America along with the low-fare airlines, but that’s just plain wrong. Both are “niche” carriers that compete on quality rather than price. Most low-fare operations are regional, operating within Asia, Europe, North America, and South America. But a few low-fare airlines operate transatlantic flights, including Air Transat, Rouge, Norwegian, Wow, and several tour-affiliated lines such as Corsair, Monarch, and Thomson. So far, no transpacific low-fare airlines have survived. Here I’ll look at some of the most troublesome gotchas on the low-fare airlines that North Americans are most likely to fly—and how, in some cases, to beat them at their own game. Before we even look at airline fees, we note that, for the most part, the true low-fare airlines install the maximum number of seats they can. Where the giant airlines’ economy seats are usually installed at a front-to-rear spacing of 31-32 inches, the low fare airlines start at 30 inches and go down to as little as 28 inches on Spirit, Frontier, and several European tour lines. Spirit and a few others try to offset the tight legroom by using extremely thin-back seats that do not recline—hence Spirit’s “pre-reclined” euphemism—which can sometimes lead to unexpectedly dire consequences. Beating the Gotcha: For safety and convenience reasons, seats in exit and bulkhead rows necessarily provide extra legroom, and almost all low-fare airlines sell these seats as a paid option. A few, including Allegiant and Frontier, have installed several additional rows of extra-legroom seats in the front of at least some planes. Southwest is a glaring exception, but it achieves the same result by selling early boarding. You want adequate legroom, you pay. Also, Canadian and some European transatlantic low-fare airlines offer premium or even business options, typically with at least 36-inch pitch and usually with upgraded cabin service. You’d never mistake their “business class” with what the giant airlines provide these days, but they don’t charge as much, either. If you thought airline seats couldn’t squeeze you any tighter than they do on 737s, 747s, 757s, and most 777s sand 787s, you’d be in for a rude shock on some transatlantic low-fare airlines. Air Transat (some planes), Corsair, and XL Airways shoehorn nine punishingly narrow seats in each row that’s supposed to accommodate just eight. Meridiana is even worse, with even-narrower eight-across seats in its 767s. Other than those horrors, low-fare airlines face the same cabin width constraints as any other lines, and generally install the same width seats. Beating the Gotcha: Obviously, the only ways to beat the seat squeeze on these few lines is to avoid them entirely. Either that or buy up to a premium option. And beware of looking up seat widths, even on such reliable sources as our sister site, SeatGuru. Because the industry has adopted an inconsistent way of measuring width, an airline can claim 17-inch seats on a nine-across 330 when those seats are actually an inch narrower than the 17-inch seats that are standard on 737s and 757s. Almost all airlines charge extra to arrange reservations and buy tickets by phone, but most low-fare airlines (other than Southwest) add additional fees during the reservation, ticketing, and check-in procedure. In Europe, EasyJet and Ryanair post supplements for buying with debit and credit cards. In the U.S., Allegiant, Frontier, and Spirit bundle plastic surcharges into the fares they display online (with a fine-print notice that lower fares may be available buying tickets at an airport counter). Allegiant and Spirit charge extra for printing a boarding pass at the airport rather than printing it out in advance on your own computer. Beating the Gotcha: You can knock a few dollars off your ticket price on several airlines by buying your ticket at an airport counter, but for most travelers, making a special airport trip to buy a ticket would entail more cost than paying the fee or extra fare for credit card use. RELATED: What Does My Ticket Fare Class Mean? For a domestic or regional U.S. or European flight on their lowest available fares, all airlines other than Southwest—giant and low-fare alike—charge for even one checked bag, with some exceptions based on frequent flyer status or use of an airline credit card. So far, the giant airlines do not charge for a carry-on bag to be stored in the overhead compartment. But some low-fare airlines do, including Allegiant, Frontier, and Spirit. Moreover, the later in the process you pay, the more you pay: Spirit’s charge for a carry-on bag, for example, goes up incrementally from the initial online booking to later online check-in to the airport counter to the gate. On intercontinental flights, the giant airlines so far do not charge for a first checked bag, and most low-fare airlines, including Air Transat, Meridiana, and XL Airways also include one checked bag in the base fare. But Norwegian does not. Beating the Gotcha: Where an airline charges for carry-on, you can avoid the fee only if your personal stuff can fit under the seat in front of you—and that’s a pretty small space. Otherwise, you can’t avoid the fees completely, but you can minimize your cost (1) by buying the baggage service you need when you first buy your ticket, and (2) on some airlines, by buying a first-tier-up fare level that includes some combination of baggage and inflight services at a better price than if you buy them separately. U.S. and Canadian airlines generally do not offer “free” meals in economy on domestic flights (with some notable exceptions), nor do European airlines on regional flights. But the giant airlines typically offer meals and minimal beverage service on intercontinental trips—as do Air Transat, Meridiana, and XL Airways. But on Norwegian or Wow (and possibly a few others) you have to pay for a meal. Beating the Gotcha: Pay up, schlep your own noshes, abstain, or buy a higher class of fare that includes meals. Most giant and low-fare airlines allow you to cancel a flight on the lowest-price “nonrefundable” ticket and retain the cash value of the ticket in the form of a future credit, less a change fee. Of course, those change fees are real gouges that may eat up the entire ticket value. Air Transat, Allegiant, Frontier, Norwegian, and Spirit also allow such changes, but EasyJet, Ryanair, and some other low-fare airlines do not. On those airlines, if you don’t fly, you’re out of luck—and your money. Beating the Gotcha: Most airlines offer “insurance” that refunds nonrefundable fares, but it’s usually standard trip-cancellation insurance that kicks in only for “covered” reasons specified in the contract—mainly in the event of accident or sickness. If you might need to cancel for work or other reasons, you’re better off buying your own “cancel for any reason” policy. Allegiant offers an interesting alternative: Its “Trip flex” allows you a one-time change in date, flight, or destination, or a future travel voucher for the full ticket cash value, for a modest fee. The cost is probably about the same as the cost of trip-cancellation insurance, but it doesn’t limit the reasons for cancellation or change—a big advantage over conventional insurance. In the event of a serious delay or outright cancellation, almost all airline contracts of carriage say that the airline will put you on their next available flight to continue on to your destination or refund the unused portion of your ticket. Most airlines say they may, subject to their sole discretion, put you on another airline, and a very few say they will put you on another airline at your discretion. Even Allegiant’s contract of carriage holds out the promise of transfer to another airline. But most low-fare airlines, including Southwest, limit you to either their own next available flight or a refund. The primary reason is that low-fare airlines typically do not have formalized interline agreements with each other or with the giant lines. And anecdotal evidence suggests that even airlines with agreements are extremely reluctant to buy seats on some other airline. As a net result, smaller low-fare airlines with comparatively few planes, and those that fly a lot of older planes, can sometimes make people wait many hours or even a day or so before they can arrange a replacement flight. Some travel agencies refuse to sell tickets on those airlines for that reason. Beating the Gotcha: If your low-fare flight is canceled or faces a long delay, ask to see a copy of the airline’s contract of carriage (it’s required to have one available to customers) and check the “failure to operate as scheduled” fine print. If the provision includes transfer to another airline, and another airline can accommodate you, insist on a transfer. 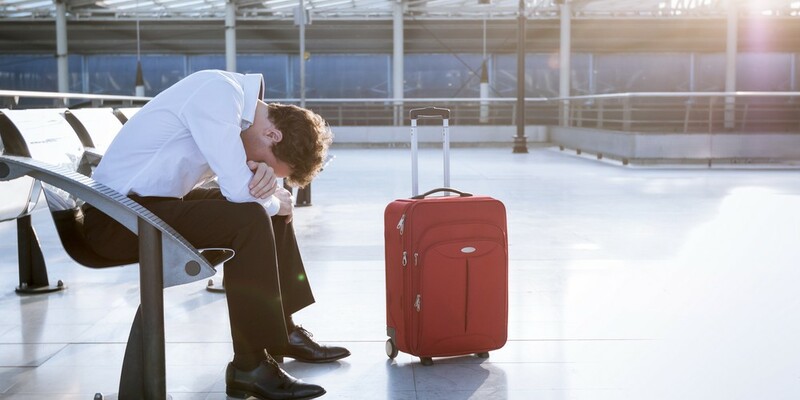 Lacking such a transfer, your only options are either to throw money at the problem by buying a ticket on any airline that can complete your trip or wait out the delay for a fix. Most giant airlines use an elaborate hub-and-spoke route system that emphasizes hub-city connections. Some low-fare airlines, including Frontier, Norwegian, Spirit, and Sun Country, also do some hubbing; they sell tickets on connecting flights and allow baggage checked through to your final destination. But Allegiant, EasyJet, and Ryanair, among others, do not deal with connections. If you want to put two flights together via one of their featured cities, you have to buy two separate tickets, exit security at the connecting airport, check in for the connecting flight, and go through security again to get to your gate. Beating the Gotcha: You can’t: Your best bet is to find a low-fare nonstop or fly a giant airline that does arrange connections. A corollary to the no-connections problem is that most low-fare airlines don’t interline. You can’t arrange a through itinerary combining flights on a low-fare airline with any other airline on the same ticket. As in the no-connection scenario, you have to buy separate tickets and treat the trip as two completely separate flights. And if your first flight is delayed or canceled and miss your connecting flight, the second airline treats you as a no-show, cancels your reservation, and voids your ticket. Beating the Gotcha: You can’t. Once again your best bet is to find a low-fare nonstop or fly a giant airline that does arrange connections. If two separate tickets is the only practical way to arrange an itinerary, allow lots of time at the connection point—at least three or four hours. RELATED: What Happens If I Need to Cancel My Nonrefundable Ticket? Some low fare airlines, including Allegiant, Ryanair, and Southwest, do not list fares and availability on some big online travel agency (OTA) websites such as Expedia. If you rely on an OTA for a fare search, you will never even see what some low-fare airlines might offer. Beating the Gotcha: Aggregators such as Kayak, Google Flights, and Skyscanner successfully identify Allegiant and Ryanair and link through to the airline to buy a ticket. Some websites, like SmarterTravel, also show Southwest fares and report on Southwest’s airfare sales. But in general, if a low fare airline goes where you want to go, it’s a good practice to check its website before you buy.